Top scorer Jason Cummings and fellow forward Matt Godden both scored twice with Siriki Dembele also on target for a Posh team who are now two points clear at the top of the League One table. 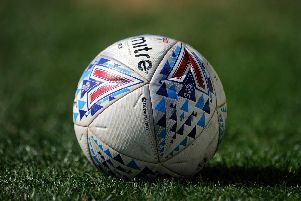 Posh took ruthless advantage of a home side who have started the season terribly and who looked shorn of confidence for long periods of the game. Plymouth gifted the first two goals in the opening 11 minutes and quickly became deflated when Posh also scored twice in the opening 10 minutes of the second half. Godden completed the rout from the last attack of the match after the home side had pulled a goal back from a corner. To the surprise of no-one, Posh named an unchanged side for the fifth League One match in a row and the match started in a familiar fashion. Posh pressed - they won a corner after 15 seconds - and made their early dominance count, although they received a massive helping hand as they soared into that early 2-0 lead. Two poor Plymouth passes, firstly by goalkeeper Matt Macey and then by centre-nack Niall Canavan, presented Cummings with the opportunity to create goals for Godden and Dembele who delivered fine finishes. Cummings accepted Macey’s present, wandered into the home penalty area and sent a delicious chip straight onto Godden’s left foot eight yards from goal in the eighth minute. The finish was clinical. And three minutes later Cummings picked up Canavan’s loose ball and freed Dembele into the penalty area and the youngster finished expertly off the inside of a post. And Posh really should have been out of sight in the opening 30 minutes. First Mark O’Hara headed over from six yards from Joe Ward’s precise free kick and then Cummings latched onto another Canavan blunder, raced clear, but clipped his shot past the onrushing Macey and the post. Plymouth were visibly boosted by the misses and they came on really strong in the final 15 minutes of the first half. Fortunately Frddie Ladapo’s finishing couldn’t match some excellent hold up play. He headed straight at Aaron Chapman twice and then lashed the best home chance over the crossbar 10 minutes before the break. Inevitably Graham Carey, who the locals reckoned had endured a tough start to the season, was at the heart of most good Plymouth moves. Carey saw his best effort tipped onto a post by Posh ‘keeper Aaron Chapman. Plymouth responded to their half-time deficit by replacing hapless centre-back Canavan with striker Ryan Taylor. The home started positively, but when referee Chris Sarginson waved penalty appeals away for a handball by Alex Woodyard, Ward freed Godden with a terrific pass. Godden looked up, spotted Cummings and played the perfect cross for the club’s top scorer to convert his fifth goal of the season. Remarkably within 60 seconds Godden was through again after outpacing former Posh defender Scott Wootton, but sliced horribly wide. But Posh didn’t have to wait too long for goal number four. Ward picked up a clearing header from a Posh corner, strolled into the penalty area and made the most of contact from Carey. Penalty said referee Chris Sarginson and Cummings smacked it home off the underside off the bar. Cummings was then denied his hat-trick by an offside flag after Colin Daniel powered a cross in from the left. The fizz went out of Plymouth after their shocking start to the second-half, but they pulled a goal back in the 92nd minute when substitute Ryan Edwards headed home Conor Grant’s free kick. But Posh were determined to have the last laugh and substitute Ibvan Toney played in Godden for his second goal in the last nminute to complete a fantastic afternoon. “I’ve got mates who can defend better than some of these Plymouth players,” one expert commentator announced, but that’s not to play down how quickly this team have gelled after being introduced to each other for the first time this summer. It should also be recognised how hard the team works for each other. It’s a promising start and it’s tough not to be excited about the future. Posh: Aaron Chapman: Jason Naismith, Colin Daniel, Rhys Bennett, Ryan Tafazolli, Alex Woodyard, Mark O’Hara (sub Louis Reed, 88 mins), Siriki Dembele (sub Marcus Maddison, 85 mins), Joe Ward, Matt Godden, Jason Cummings (sub Ivan Toney, 75 mins). Unused substitutes: Mark Tyler, Callum Cooke, Josh Yorweth, George Cooper. Plymouth: Matt Macey, Yann Songo’o (sub Gary Sawyer, 56 mins), Scott Wootton (sub Ryan Edwards, 56 mins), Ashley Smith-Brown, Niall Canavan (sub Ryan Taylor, 46 mins), Jamie Ness, Antoni Sarcevic, Tafari Moore, Conor Grant, Graham Carey, Freddie Ladapo. Unused substitutes: David Fox, Joel Grant, Gregg Wylde, Kyle Letheren. Goals: Posh - Godden (8 mins & 90 + 4 mins), Dembele (11 mins), Cummings (48 mins & 54 mins, pen). Plymouth - Edwards (90 + 2 mins). Cautions: Plymouth - Sarcevic (foul). Alan Swann was at Home Park for the Peterborough Telegraph so check back for match reaction.